(Portland, Oregon) – The heatwave hitting Portland and northwest Oregon is only providing inspiration for one tiny eatery in the Beaverton area. 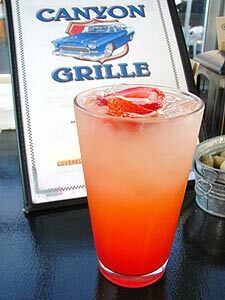 Canyon Grille, On SW Canyon Road, in the “auto row” district, is digging into local gardens to cool the heated palates of those in the Raleigh Hills/West Slope area with a bundle of fresh fruits turned into refreshing liquids. Among the new offerings are their fresh lemonades or the strawberry lemonade, in which you’ll find large chunks of real strawberries gracing the bottom of your glass. Served in a pint glass, the strawberry concoction is an especially enticing thirst quencher, with a minimum of the sugar overkill that usually comes with such drinks, and lots of that real and natural sugar vibe. Canyon Grille’s milkshakes have been a growing bit of legend in the neighborhood, with owner Opal Lawson and her staff coming up with all sorts of crazy creations that can include real fruit to coffee or whatever oddball insight that may strike them at the last minute. But for summer, they’ve streamlined the experimentation a bit and concentrated on the real fruits, like shakes made from blackberries, peach, strawberries, raspberries, watermelon, or even a favorite experiment from last fall’s Halloween season – the caramel apple. For $3.95, they hit you with a large cup filled with not only nicely done ice cream as the base for the shake, but real chunks of fruit are floating around in the lovely, frozen mish mash as well. They have proven brutally popular in the heat of this week, especially in the Canyon Grille’s outdoor seating area, as folks kick back in the shade – while traffic on Canyon Road whizzes by barely noticed on the other side of a highly effective wall that includes large plants. Canyon Grille is quickly becoming the culinary secret that the West Slope neighborhood can’t keep, with many – including other nearby restaurateurs – proclaiming it the “best burger” they’ve ever had. This is their mainstay, their flagship dish, to be sure. But other monsters for the palate are quickly becoming evident as well. In spite of this week’s pervasive summer heat, each first weekend of the month features their own unique brand of barbecue. Pork, beef and chicken get smoked outdoors for around a day or so, and these are prepared with the staff’s own creative rubs and sauces. Also, breakfasts are the big thing in the mornings on each Saturday and Sunday, as Opal and husband Perry in recent months started some engaging new takes on omelets and other morning dishes. Their omelets are especially gargantuan, filled with a variety of fresh veggies and/or meats, and various gourmet cheeses, while their own homemade gravies send vast waves of pleasure through your brain. It's like downhome gourmet - and surely it's Food Network-bound, if there's any justice in the universe. Whatever the case, if you live in Portland, or are coming through soon, this should be a must-stop. Note: in the interest of full disclosure, this place is right up the street from OregonTravelDaily headquarters and a big addiction here. Canyon Grille is at 8825 SW Canyon Road, in an odd triangular block across the street from the Lexus dealership. 503-292-5131.